This is an all time favorite toy in our home! Both of my children love to play with these blocks. My daughter builds high towers using the largest block as the foundation all the way up to the tiniest block. My son loves to place the blocks within each other in the correct order, which is a tidy way of storing them nested together. 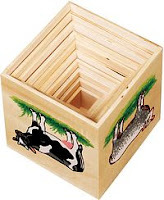 The farm animals on the sides are great for teaching animal names and sounds. We have had these blocks for over a year and have needed to glue one of the sides on one block back together, otherwise they are very durable. The nice thing about wooden toys is they are easily repaired with wood glue, whereas once a plastic toy breaks it can be difficult to repair. Another great toy from Melissa and Doug!